This may seem like a no-brainer to some of you, but to those less practiced, actually thinking about HOW a product is packaged doesn't come naturally. I think it requires the same retraining it takes to get people to read nutrition labels. Unless you're raised or taught how to think about it, you don't think about it. So the thing I want to draw attention to this week is "precycling". Before you make the decision to bring anything into your house, ask yourself: do I know what I'll do with (a) the packaging and (b) the thing itself, once it's fulfilled its purpose? Some choices are easy. If you're shopping for eggs, you rarely have to buy ones packaged in plastic or styrofoam. 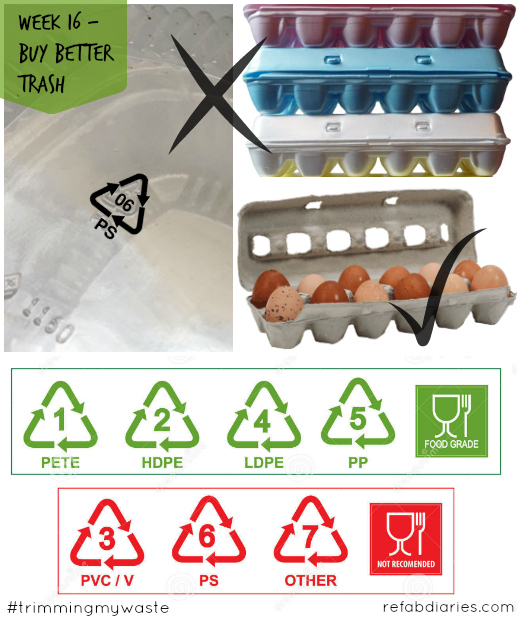 It's always easy to get eggs packaged in recyclable (and returnable, if you're shopping a farmer's market) paper-mulch cartons. Similarly, some dry pasta is packaged in plastic bags. But most manufacturers actually use recyclable, uncoated cardboard boxes for their product. So it's an easy choice (of course buying it in bulk, using your own bag, is ideal). Other choices are a lot more complicated, especially where plastic is involved. The first step to buying better trash is knowing what your local recycling facility will and will not recycle. In the US, check RecycleByCity and this very detailed chart from Goop. Elsewhere, check your local facility's website and contact them if their rules aren't clear. Ideally, we'd like to avoid plastic altogether. But when you are about to buy plastic packaging, one thing you can do is make sure it's plastic that's recyclable wherever you live. For example, #6 plastic is essentially styrofoam and NOT accepted by pretty much any recycling facility. But manufacturers continue to sneak it in. Chobani announced years ago that they were switching from #6 to #5. But I turned over one of their "Flip" containers last week and what do you know? It's made of #6 plastic. Disappointing considering their apparent "green" stance. So. Keep your eyes open.